A new approach for prediction of face advance rete (FAR) prior to mining operation and determination of the operation efficiency after mining operation in retreat longwall mining panel is presented based upon the concepts of rock engineering system (RES). For this purpose, six longwall panels considered in Parvadeh-I coal mine. Seven major effective parameters on FAR was selected including coal mine roof rating, gas propagation, safety factor of longwall face, ratio of joint spacing to cutting depth at longwall face, longwall face inclination, panel width, floor rock mass rating. 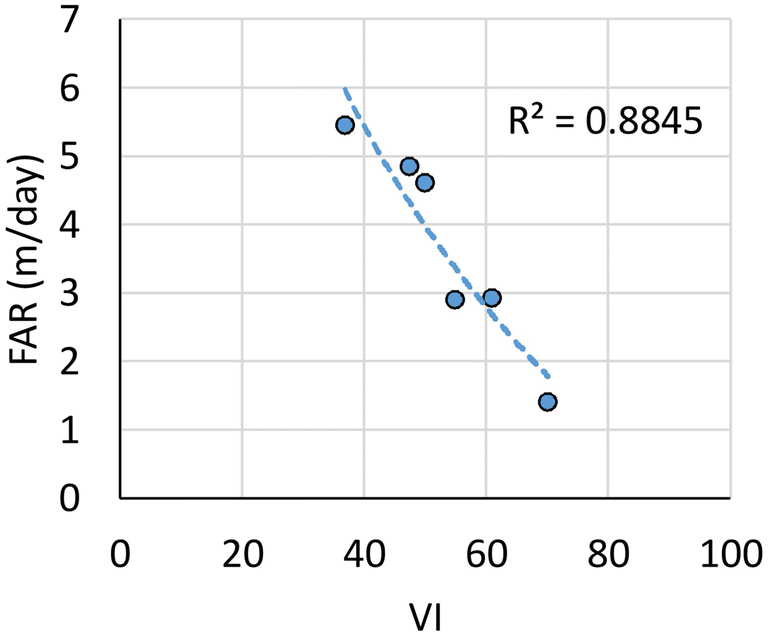 To performance evaluation of the presented model, the relationship between the average vulnerability indexes of advance operation with FAR was determined in considered panels with coefficient of determination (R2) equal to 0.884 that indicate relatively acceptable correlation and compatibility. Investigations of the research indicated that it is possible to determine the actual operation efficiency under fair conditions by a RES-based model. 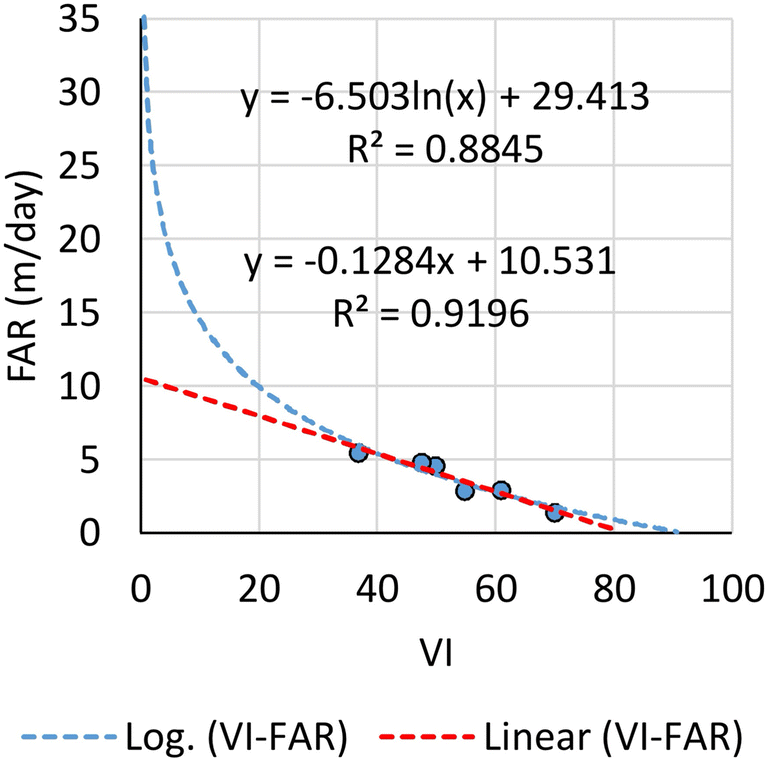 The inevitable reduction of FAR for each longwall panel was determined by presented model that the difference amount between the maximum possible practical face advance rate (FARmpp) and recorded actual face advance rate (FARa) indicate the operation efficiency. Applied approach in this paper can be used to prediction of FAR in retreat longwall mining panel for same conditions that can have many benefits, including better and more accurate planning for the sales market and mine operation. 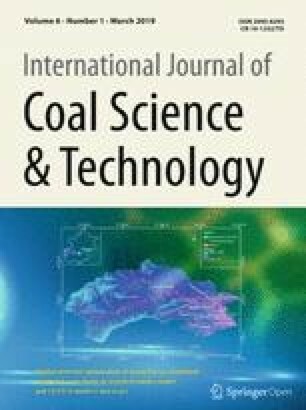 Also, presented method in this paper can be applied as a useful tool to determination of actual operation efficiency for other sections and extraction methods in coal mines. 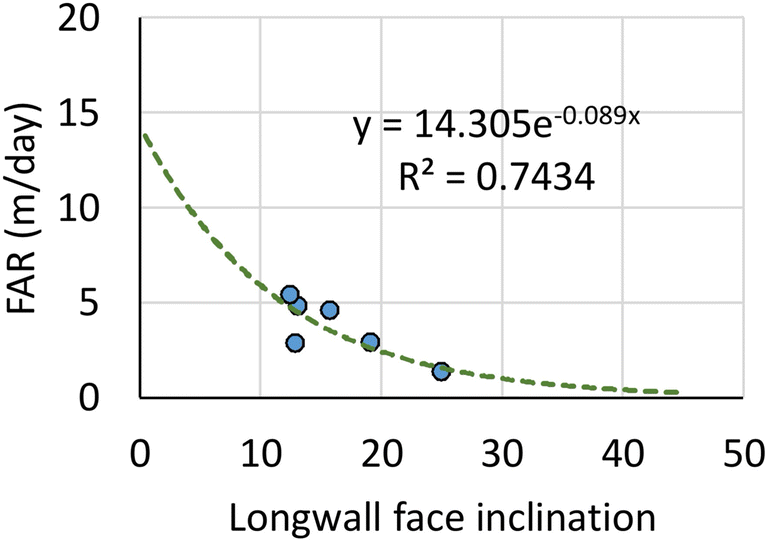 Prediction of face advance rate (FAR) in longwall panels has many benefits, including better and more accurate planning for the sales market, preparation of next longwall panels, technical–economic analysis for the purchase of new equipment, simultaneous extraction in multiple seams mining and other. The main parameters affecting FAR include gas propagation, roof and floor conditions, panel width and other. Each of these parameters in their bad conditions can reduce the FAR, alone or in interaction with each other. 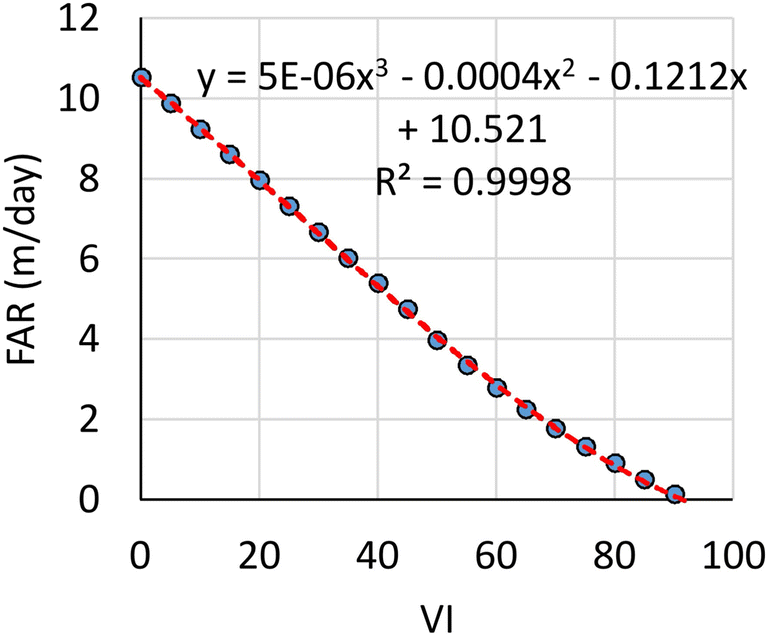 The contribution and magnitude of the effect of each parameter on the reduction of FAR can be determined using the rock engineering system (RES) method. In this paper, a new RES-based model is presented to prediction of face advance rate (FAR) prior to mining and investigation of operation efficiency at retreat longwall face. In this paper, E0, E2, E3, W0, W1 and W2 panels in Parvadeh-I coal mine are taken into account. Extraction time sequence of these panels is equal to E2, W1, W0, E0, W2, E3, respectively. The first extracted panel was E1 that due to the lack of data is not considered in this study. In E2 panel, FAR reduce to 0.1 m/d for several times due to roof and floor instability. Parvadeh-I is one of the underground coal mines located in the south- east of Tabas, Iran. A brief summary of geological and geotechnical information about Parvadeh-I coal mine is presented in Table 1 (Adam Consulting engineers 2005; IRASCO et al. 2005a). Figure 1 shows the layout of the panels in Parvadeh-I coal mine. The information about considered panels for this research is presented in Table 2. The control system of powered supports in Parvadeh-I is manual. In this paper, based on the concept of RES, the most effective parameters on reduction of FAR have been obtained. By using RES, vulnerability index (VI) of advance operation have been determined. This index determine the vulnerability amount of advance operation or in other word, reduction amount of FAR without considering the operating parameters such as level of personnel skills, level of planning, level of performance of the equipment’s and the level of overhaul operation. 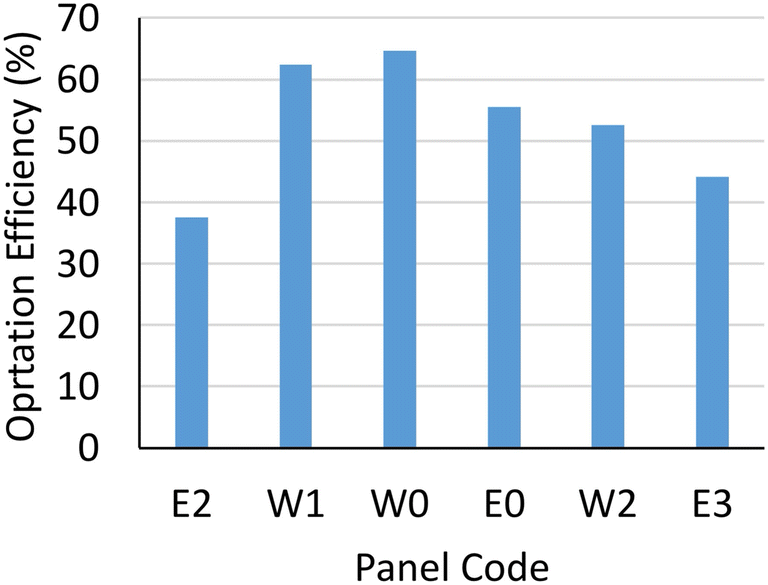 To validate and determine the performance of the presented model, the results obtained of RES-based model were compared with the FAR in considered panels. Finally, by using presented RES-based model and determination of maximum possible theoretical FAR in each panels, an equation have been developed for determination of operation efficiency. If the level of planning and operation be good and everything be conducted carefully, maximum possible practical FAR in conditions of considered panel (determination by RES-based model and maximum possible theoretical FAR) should be equal to the achieved FAR in practice. Difference between the predicted FAR and operational FAR indicates bad level of operation include level of personnel skills, level of planning, level of performance of the equipment’s and the level of overhaul operation. where Ci is the cause of the ith parameter, Ei is the effect of the ith parameter. 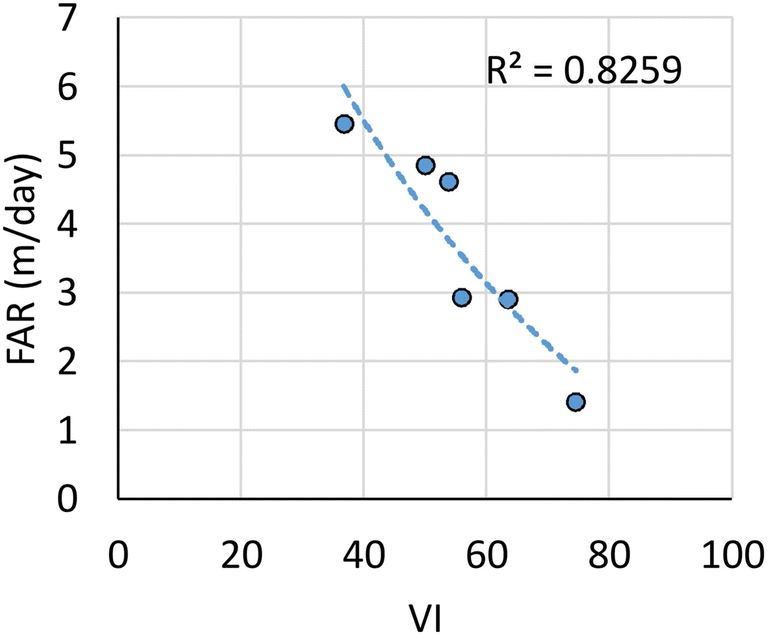 In this research, determination of the vulnerability index (VI) of advance operation refers to the rate of reduction of FAR under bad conditions of main effective parameters. Using collection of pre-existing information include geological, geotechnical and operational information and recorded data include geological and geotechnical data that surveyed along the each roadway along the panel roadways, the VI of advance operation was predicted for considered points along the tailgate and main gate of each panel. These points located along the panel gates with equal interval; for example, strap 970–1010 m in tailgate of E2 panel is identified by point 1000. The amounts of FAR and each parameters were determined for each of points and then, VI of advance operation was determined for them. In the next step, the recorded actual FAR in each panels compared with determined VI’s to evaluation of models performance. Step 1 selecting the effective parameters on FAR and evaluate the ai by RES. Step 2 determining the VI using Eq. (2) (Benardos and Kaliampakos 2004). where ai is the weighting of the ith parameter, Qi is the value (rating) of the ith parameter, and Qmax is the maximum value assigned for ith parameter (normalization factor). When the VI value is approaching 0 the risk level of the hazard is lower, while its value approaching 100 shows that the risk level of the hazard is higher, at the considered site. Step 3 investigating the relation between VI of advance operation and FAR to evaluation of RES-based model performance. In step 2, an methodology similar to the work carried out by Benardos and Kaliampakos (2004) is adopted to define a model to determine the VI of advance operation in longwall panels and determination of the performance of presented RES-based model by investigation of the correlation between the estimated VI and face advance rate (FAR) for considered panels. To investigate of operation efficiency, Eq. (3), (4) and (5) was developed, respectively. In Eqs. (3), (4) and (5), FARmpt is the maximum possible theoretical FAR (m/d), PW is the panel width, EShS is the equivalent shearer machine speed in condition of manual control system for powered supports in Parvadeh-I (considered equal to 16 ft/min (Oraee 2011), UST is the unavoidable stop times due to work of equipment’s at longwall face, TOC is the total useful working time in a day (is equal to 1080 min, in normal conditions), WW is the web width of shearer machine (equal to 0.8 m for cutter machine in Parvadeh-I), FARmpp is the maximum possible practical face advance rate, VI is the vulnerability index of advance operation in considered panel, FARa is the recorded actual face advance rate in considered panel and E is the operation efficiency in considered panel (%). If the level of planning and operation be good and any things be done carefully, FARmpp in conditions of considered panel must be equal to achieved FAR in practice, therefore, E equal to 100%. Difference between the FARmpp and FARa indicates low efficiency and bad level of operation include level of personnel skills, level of planning, level of performance of the equipment’s and the level of overhaul operation of the equipment’s. Increase of gas propagation more than allowable amount, roof fall and floor failure are main hazards that reduce the FAR in longwall face. Many parameters affect the roof stability, floor stability, and level of gas propagation that simultaneous these parameters affect the advance operation at a longwall face. Based on the investigations in this research, seven major contributing parameters on FAR at a longwall mining face are considered to the RES-based model and performing the interaction matrix (Table 3). where SF is the safety factor of coal face, σc.w is the wall coal strength of 0.75 m in width, σyy is the vertical induced stress at a 0.75 m distance from the coal face, and f is the correction factor of joint orientation at a coal seam. F is equal to (1-B) that B is orientation factor for critical joint set. In this research, influence of underground water and depth of panel is considered indirectly by CMRR and safety factor of face, respectively. The effect of transitional geology on FAR investigated by (Jun et al. 2016) but, any reports about this parameters is not recorded in the Parvadeh-I coal mine. The control system of powered supports is the other main parameter that affects the FAR in longwall face. Currently, there is only one longwall system in the Parvadeh-I coal mine and the control system of powered supports is manual. Based on the selected seven parameters, interactive matrix was formed as shown in Table 4 for FAR. ai value for the principal parameters of the FAR are illustrated in Fig. 3. ai values represent the interactive intensity value of each parameter. 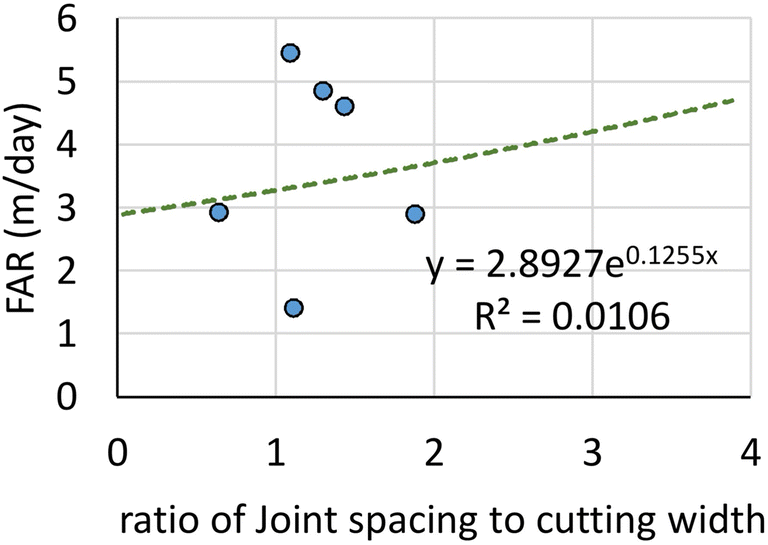 As it could be seen in the table, panel width (P6), safety factor of coal face (P3) and the ratio of joint spacing to cutting depth at face (P4) appeared to have the highest weights in the system and could highly influence the other elements. In order to calculate the Qi/Qmax in Eq. (3), the rating of parameters’ value was obtained based on their effect on FAR. Totally, six classes of rating, ranging from 0 to 5, were taken into account, where 0 denotes the worst case (maximum effect on reduction of FAR) and 5 is the best case (minimum effect on reduction of FAR). 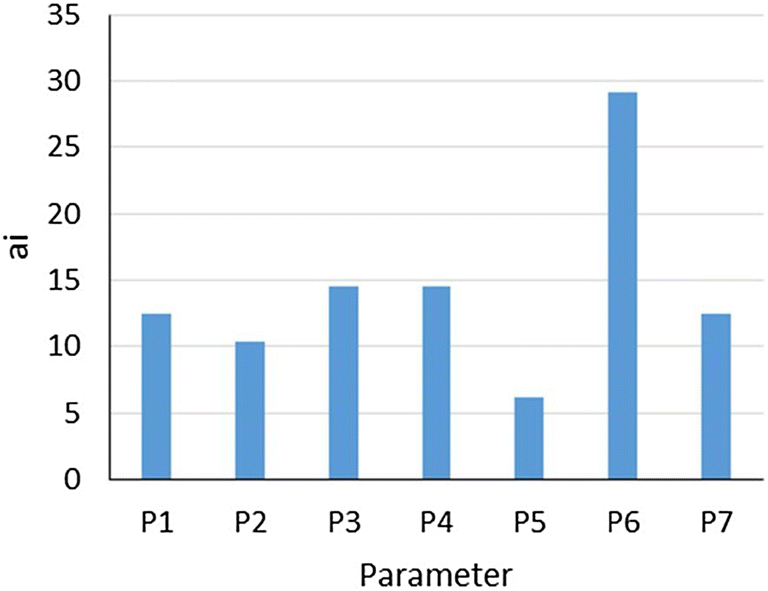 For FAR, on the basis of experts’ views and also investigation and results of this research, the rating for each parameter is revealed in Tables 5. For example, as it can be seen in Table 5, based on the conducted studies, in a wider to much wider panels, the high volume of roof falls, high roof loading, high roof convergence and high level of gas propagation, result in reduction of FAR at longwall face (high level of VI); therefore, a rating of 0 or 1 was considered. In addition, in narrower panels (less than 100 m), since the volume of roof falls is low, the loading and convergence is low to very low, gas propagation level is low, result in high FAR (low level of VI); consequently, a rating of 4 was considered. To determine the VI of FAR at retreat longwall mining face, Eq. (2) was used. For this purpose, E0, E2, E3, W0, W1 and W2 panels were taken into account in Parvaadeh-I coal mine. Description of FARa and determined VI’s on considered panels are presented in Tables 6 and 7, respectively. 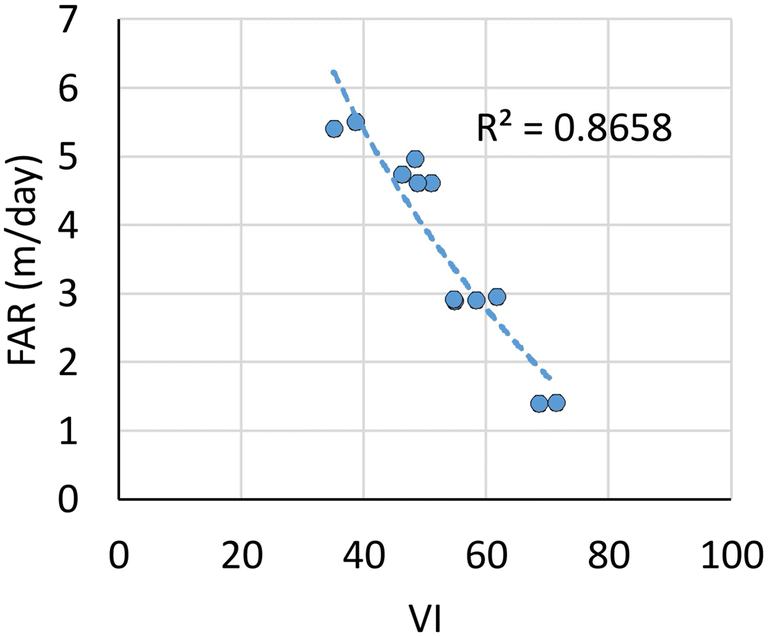 Furthermore, performance of the presented RES-based model can be proven by correlation between the estimated VI’s and FAR at the considered panels. 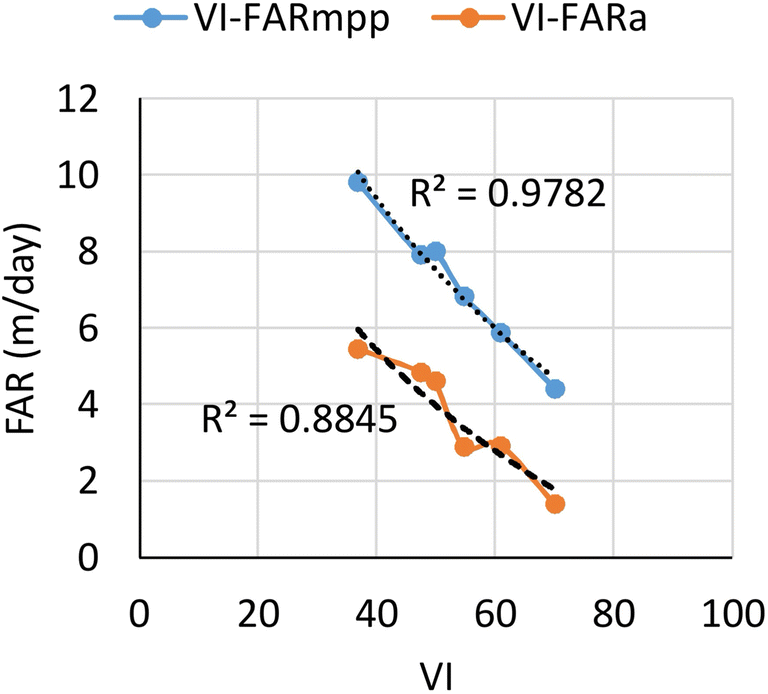 For this purpose, the correlation and determination coefficient (R2) between the mean of estimated VI’s and FARa for considered panels is presented in Figs. 4 and 5. To determine the best and most realistic prediction of FAR in considered condition, the results of several linear and non-linear regression methods were compared to each other and two most appropriate methods were selected (Fig. 6). The maximum available FAR is equal to 9 to 10 m/d in the best conditions at Parvadeh-I coal mine. The maximum available FAR was announced equal to 9 meters per day by mining engineers in the best conditions at Parvadeh-I coal mine. 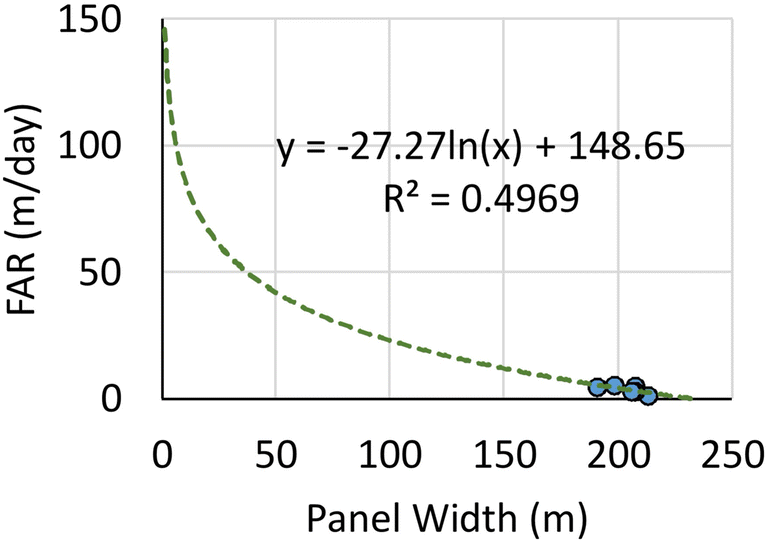 Also, the maximum available FAR was estimated equal to 14–16 m/d for considered panels based on existence longwall face equipment’s, presented equations in this research and panel width. Therefore, at about maximum available FAR, the linear regression appeared to be the best fit. On the other hand, the FAR must be equal to 0 at VI close to or equal to 100 that in this regard, the logarithmic regression shows the best fit. 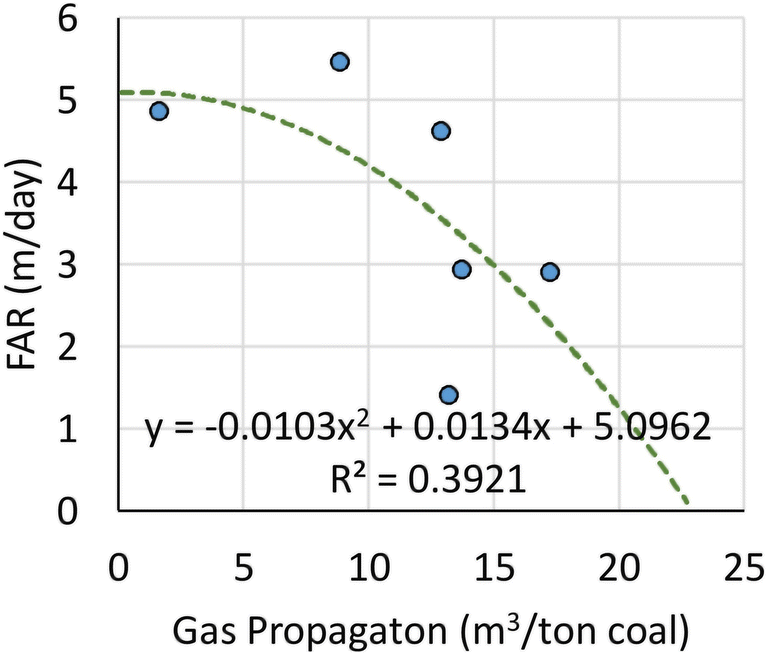 Finally, by combining linear regression with logarithmic regression, an equation was proposed to prediction of FAR in conditions of Parvadeh-I coal mine (Fig. 7). The relationship between the CMRR, gas propagation, safety factor of longwall face, ratio of joint spacing to cutting depth, longwall face inclination, panel width and floor RMR (quantitative parameters) with FAR was investigated and results are presented in Figs. 8, 9, 10, 11, 12 13 and 14, respectively. In this regard, description of average amount of parameters are illustrated in Table 8. 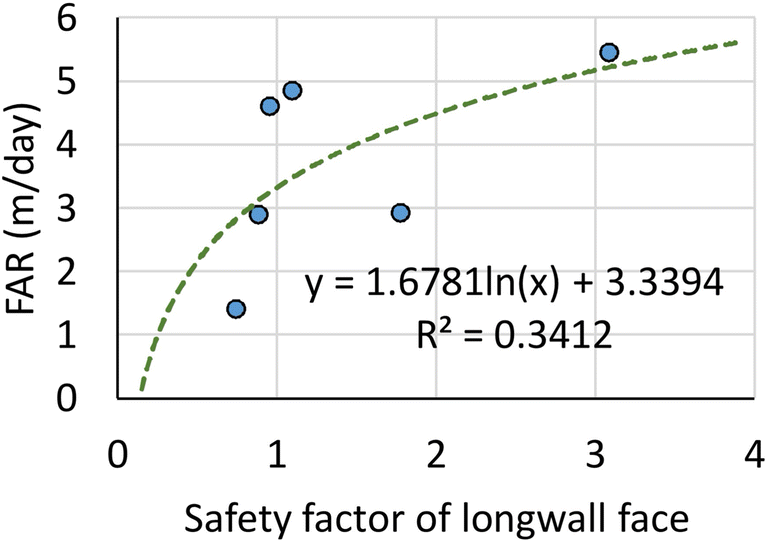 The sensitivity analysis showed that the FAR is most sensitive to variety in of panel width, longwall face inclination and gas propagation, respectively. According to these results, selection of the optimum panel width and gasification operation of deeper panels must be one of the most major concerns in Parvadeh-I mine. Determination of the relation between the selected parameters and FARa can show the success rate in selecting these parameters. Although this may not be a perfect criterion for this purpose, because in the RES the interaction between the parameters is considered, the mean of each parameter was considered in each panel and the conditions of each site may vary from another site, but it can be one of the criteria (Table 9). However, influence of joint spacing at unconfined span of face is definite on roof fall and FAR but, according to the obtained results from sensitivity analysis, the effect of removing P4 was investigated and results are presented in Fig. 15. Achieving a way to measure the efficiency of operations and personnel is very important. This may be a bit more complicated in underground coal mines, where there is a lot of hazards and the extraction of operations can be affected by inevitable conditions. Here, using the presented RES-based model, the inevitable reduction of FAR was determined for each longwall mining panel. The difference between FARmpp and FARa shows the operation efficiency (Fig. 16). To determine the operation efficiency in each panel, Eqs. (3) to (5) was used and results are presented in Fig. 17. 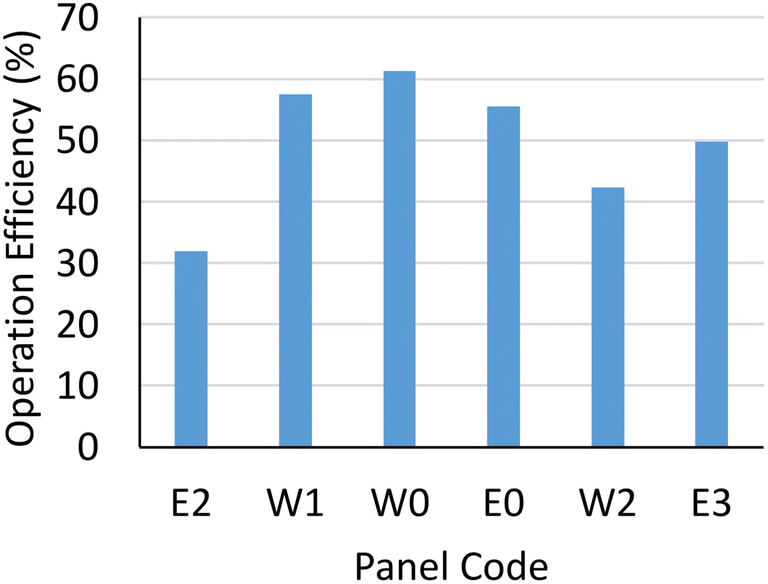 These results showed that the operation efficiency had been very low in the second extracted panel in Parvadeh-I (E2 panel); after an increasing efficiency in next panels, a significant reduction in efficiency in W2 panel was observed. In the E2 panel, there were many problems due to the roof fall and the floor failure, and in the W2 panel, the problems caused by high gas propagation reduced the efficiency. Investigations showed that there had no proper operational reaction in crisis conditions (Fig. 18). This research presents a rock engineering system (RES) based model to predict the face advance rate (FAR) and determination of the operation efficiency in retreat longwall mining face. For this purpose, six longwall panel considered in Parvadeh-I coal mine. 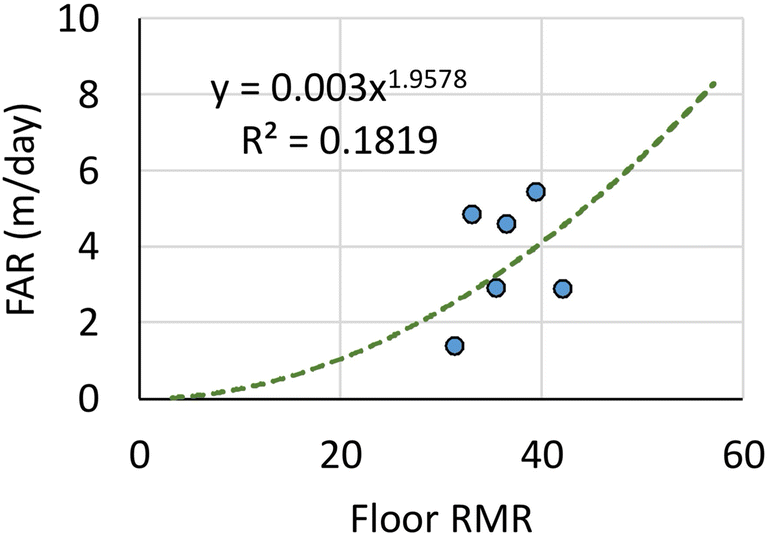 Performance evolution of presented model showed that there is an acceptable correlation and compatibility between the level of determined vulnerability indexes of advance operation and FAR with R2 of 0.884 for all estimated VIs in considered panels. RES outputs identified the most effective parameters on FAR in longwall face include panel width, safety factor of longwall face and ratio of joint spacing to cutting depth, respectively. Sensitivity analysis showed that there is a relationship between the all selected parameters with FAR in Parvadeh-I coal mine and the FAR is most sensitive to varieties in panel width, longwall face inclination and gas propagation, respectively; According to this results, selection of optimum panel width must be the one of the important concerns in this mine. Upgrading the control system of powered supports can reduce the constraints in increase of panel width. 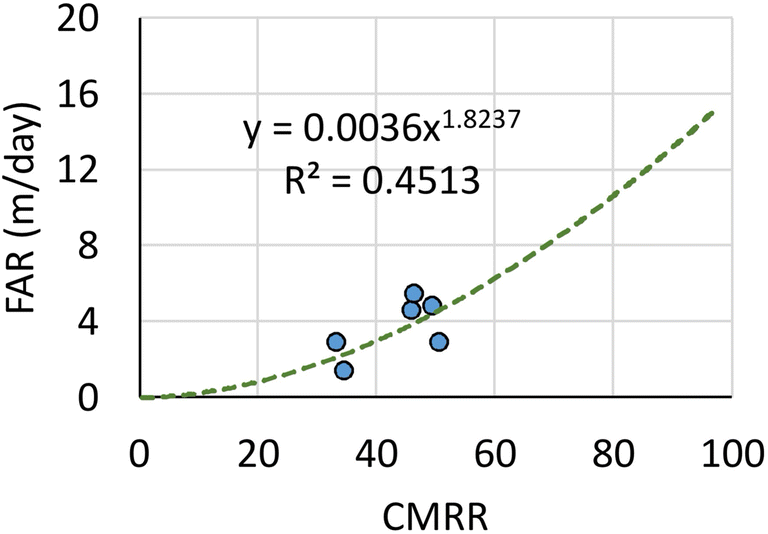 Investigations of this research indicated that it is possible to determine the actual operation efficiency under fair conditions by a RES-based model. Presented model determined the inevitable reduction of FAR for each longwall panel that the difference amount between the maximum possible practical face advance rate (FARmpp) and recorded actual face advance rate (FARa) indicate the operation efficiency. Applied approach in this paper can be used to prediction of FAR in retreat longwall mining panel for same conditions that has many benefits, including better and more accurate planning for the sales market, preparation of next longwall panels, technical–economic analysis for the purchase of new equipment, simultaneous extraction in multiple seams mining and other. Also, presented method in this paper can be applied as a useful tool to determination of actual operation efficiency for other sections and extraction methods in coal mines. The authors gratefully acknowledge the engineering team in Parvadeh-I Coal Mine (Tabas Parvadeh Coal Company, Tabas, Iran) in particular Ali Keshvari, mine manager, and Ali Hosseini, head of education, for providing access to all required information and all mine sections for this research.